Camera footage has been leaked showing an England football fan punching a friend in the face, earning him a suspended 10-month prison sentence. 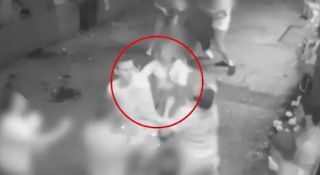 The incident occurred last summer after England’s win over Sweden at the World Cup in Russia, with footage only just being released. As seen in the video below and as noted by The Sun, Robert Hurst can be seen on the CCTV footage flooring his friend with a single punch, knocking out seven of his teeth and reportedly leaving him on the ground for around three or four minutes. Fortunately, it’s understood that he escaped any serious injury in the altercation, but Hurst has now received a suspended 10-month prison sentence after he pleaded guilty to a GBH charge. Further, he has been ordered to pay £3,500 to the victim as well as doing 250 hours of unpaid work. In turn, his dangerous and drunken actions have cost him, on a night where he surely should have been busy celebrating England’s win.